Description: M BARSBD4-20 With BNSF 7315, BNSF 2358, BNSF 7815, BNSF 5126, BNSF 4558, BNSF 7475 & BNSF 4316 with 49 Loads, 6492 Tons, 3312 Feet. Photographed at 18:07. Description: The Ringling Bros. and Barnum & Bailey Circus (red unit) train winds through the curves at Marcel, high in the Tehachapi Mountains. The train, operating from Fresno to San Diego, has three BNSF ES44DCs (7315, 7646 and 7216) on the point, and is made up of 59 cars (34 coaches, 18 flats, 4 stock cars, 2 COFC and 1 bi-level auto rack) - 4290 tons and 5235 feet in length (not counting the diesels) - nearly a mile long! Description: On Tuesday, July 12th, 2011, the Ringling Bros. and Barnum & Bailey Circus (red unit) train (BNSF symbol U-FRSSDG1-12A) passes under the classic signal bridge at the north end of Mojave after having conquered the crossing of the Tehachapi Mountains as the show relocates from Fresno, CA, to San Diego (arrival in San Diego will be in the wee hours of the morning the next day). The train has three BNSF ES44DCs (7315, 7646 and 7216) on the point, and is made up of 59 cars (34 coaches, 18 flats, 4 stock cars, 2 COFC and 1 bi-level auto rack) - 4290 tons and 5235 feet in length (not counting the diesels) - nearly a mile long! Description: Stretching out for a mile, the Ringling Bros. and Barnum & Bailey Circus (red unit) train has been steadily climbing the grade out of Bakersfield for 12 miles on its approach to the crossing of the Tehachapi Mountains. Seen here at Sandcut, the 59-car train (34 coaches, 18 flats, 4 stock cars, 2 COFC and 1 bi-level auto rack) weighs 4290 tons and, without power, is 5235 feet in length. Power for the train (symboled as BNSF train U-FRSSDG1-12A) consists of BNSF ES44DCs 7315, 7646 and 7216, which will lift the train up to the 4000’ summit at the town of Tehachapi, then on to Barstow, across Cajon Pass and down the Pacific Coast to San Diego – a trip of about 460 miles from its origination point of Fresno (in California's Central Valley). Description: On Tuesday, July 12th, 2011, the Ringling Bros. and Barnum & Bailey Circus (red unit) train approaches Tunnel 2 in the Tehachapi Mountains as the show relocates from Fresno to San Diego (arrival in San Diego will be in the wee hours of the morning the next day). The train has three BNSF ES44DCs (7315, 7646 and 7216) on the point, and is made up of 59 cars (34 coaches, 18 flats, 4 stock cars, 2 COFC and 1 bi-level auto rack) - 4290 tons and 5235 feet in length (not counting the diesels) - nearly a mile long! Description: The Ringling Bros. and Barnum & Bailey Circus train crosses over itself on the Tehachapi Loop on July 12, 2011. Description: BNSF 7315 is seen heading up the eastbound U FRSSDG1 12, the 2011 "Fully Charged" Ringling Bros. and Barnum & Bailey Circus train. Title: BNSF 7315 West, RBBX Bound For San Diego! Description: BNSF 7315 is seen heading up the eastbound U FRSSDG1 12, the 2011 "Fully Charged" Ringling Bros. and Barnum & Bailey Circus. A soon to be replaced searchlight signal is seen alongside the train, which this possible being the last time the Circus will ever pass by this old relic. Description: BNSF ES44DC 7315 leads 7 business cars on Whitefish, MT to Topeka, KS positioning move O-WHITOP1-09 through Roca, NE on the BNSF St Joseph Subdivision. Title: BNSF 7315 Leads a Nb grain train. Description: roster shot of this Nb freight train with a gevo dc unit leading. Description: WB Z-train zips through Snohomish. 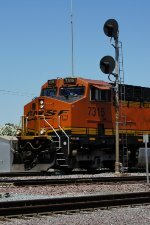 Title: BNSF 6873 Heads EB z train! Description: EB stack train Thur la Plata Mo on the Transcon. Title: BNSF 7530 Heads up 3 unit's on a SB freight train.. Description: Freight coming in from the Saint Joe Sub.. Description: BNSF 7315 leads this loaded iron ore train out of Foley. Mo. near Mp. 59 on the BNSF Hannibal Sub.